It is a Red Blue Dual LED Voltmeter Ammeter,Supply voltage: DC 3.5-28V,Measurement range: DC 0-999.9.. It is a Digital Voltage&Ammeter,Dual 0.28" LED digital 4 bit tube,Supply voltage: DC 3.5-28V,Measure.. It is a Blue LED Ampere Meter With Current Shunt Resistor,Measurement Range:DC 0-300A,Power Supply:.. It is a Red/Blue/Yellow/Green LED Ampere Meter+ Current Shunt,Measurement Range:DC 0-100A,Power Supp.. It is a Yellow LED Ampere Meter+ Current Shunt,Measurement Range:DC 0-20A,Power Supply:DC 7-30V,smal.. It is a Red LED Ampere Meter+ Current Shunt,Measurement Range:DC 0-20A,Power Supply:DC 7-30V,small s.. It is a DC 0A-5A Red LED Digital Ammeter,4V-30V Powered,Refresh rate: about 200ms time,Application: .. It is a DC 0A-1A Yellow LED Digital Ammeter,4V-30V Powered,Refresh rate: about 200ms time,Applicatio.. It is a DC 0A-1A Red LED Digital Ammeter,4V-30V Powered,Refresh rate: about 200ms time,Application: .. It is a DC 0A-10A Green LED Digital Ammeter,4V-30V Powered,Refresh rate: about 200ms time,Applicatio.. 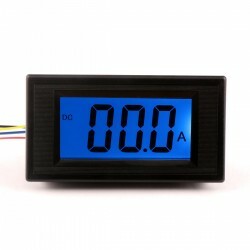 It is a DC 0A-5A Blue LED Digital Ammeter,4V-30V Powered,Refresh rate: about 200ms time,Application:..